Ship a motorcycle to or from Alaska the fastest and safest way. Servicing all Alaska ports and every state nationwide, we offer the most convenient and affordable motorcycle shipping options. We specialize in shipping all types of motorcycles, scooters and mopeds to and from Alaska. Service from any port in Alaska to any residential or business location in the lower 48. Your motorcycle will be shipped from your port of choice in Alaska and delivered to any stateside destination. Upon arrival at the stateside port, a certified carrier will load your motorcycle and complete the delivery to any residence or business location within the United States. Service from any residential or business location in the lower 48 to any port in Alaska. Your motorcycle will be picked up by a certified carrier directly from your specified location and delivered to the stateside port. 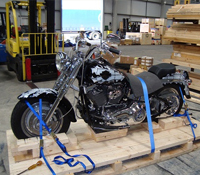 Upon arrival at the stateside port, your motorcycle will be carefully loaded onto the vessel and secured until it reaches your destination port of choice in Alaska. "Faster & cheaper than all the other companies"
The best price and fastest service out of 5 different shippers. 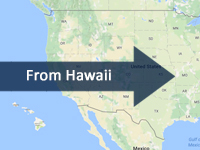 "Great experience with Hawaii Car Transport"
They picked up my motorcycle quicker than all other transport companies. "Delivered my bike on time & in perfect condition"
I was given plenty of notice before delivery - Excellent shipping service. With multiple sailings between Alaska and the lower 48 every week, we offer the most convenient options when shipping a motorcycle to or from Alaska. Servicing Anchorage, Fairbanks, Dutch Harbor, Kodiak, Juneau, Ketchikan, Sitka, Petersburg, Wrangell, Craig, Kake, Hoonah, Haines, Skagway, Yakutat, Cordova, Thorne Bay and Valdez. Our team of transportation professionals will ensure that your motorcycle is handled with the utmost care from start to finish. Fully enclosed shipping provides your motorcycle with maximum protecion during transit. Inspection reports will be completed throughout your shipment to ensure that your motorcycle received in the same condition as when it was handed over. 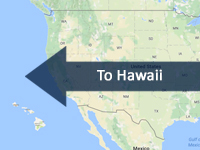 Direct service to and from any residential location in the lower 48. We take care of the trucking to and from the stateside port and work around your schedule to make the entire process as simple and convenient as possible. Have Questions About Your Alaska Motorcycle Transport? Call (907) 331-3100 to discuss your transport with a shipping coordinator today.